It’s the year 2394, Romulus and Remas are no more and the Enterprise-E has been decommissioned. The Cardassians are allied with the Federation/Klingon Alliance, there’s peace with the Dominion, and there’s a ‘cold war’ with the Romulans and the rest of the Typhon Pact. It’s a time of change for the Federation and the rest of the Galaxy. Starbase 400 is a Spacedock type station orbiting Kaleb IV in Beta Quadrant, which sits close to Klingon, Romulan, Gorn, Tholian, and Krazzle territories as well as open space and the unclaimed ‘Triangle’, home to pirates and criminals. 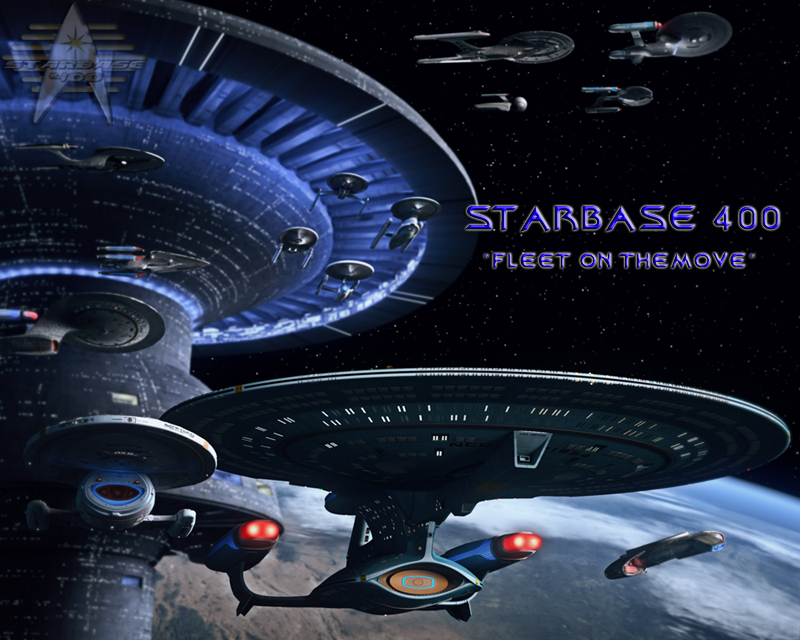 Starbase 400 has become key to the Federation’s future. She’s the Flag Base for a major section of the Beta Quadrant call the ‘Ares Operational Theater’ and is home to a variety of Support ships. Classes include; Galaxy Refit, Defiant, Intrepid, Sovereign, Ronin, Akira, Prometheus, Nova, Nebula, Ambassador, Excelsior, Steamrunner, Diligent, Constitution Refit, Saber, Olympic, Gladiator, Centaur, Interceptor, Miranda Refit, and Luna! The crew is assigned to a wide variety of mission types including Exploration, Science, Federation Defense, Combat, Covert Operations, Intelligence Gathering, Emergency Response, and much more. Starbase 400 is a slow paced, highly detailed, active sim that has developed a vast back-story, complete with two dozen permanent NPCs, a fleet of ships, and a dangerous intersection of space to defend. To support its in character universe, Starbase 400 maintains an academy, a database, a timeline of sim canon, and logs of each mission to ensure members are informed. Infused with a focus on character development and realistic storytelling, these factors combine, producing an intensely vibrant sim. 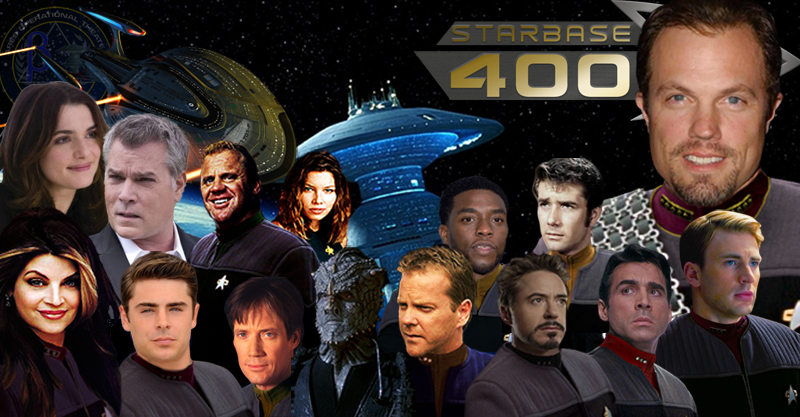 On Starbase 400, we focus on character development and realistic storytelling. As a friendly community of adult fans and writers, we strive to work together to produce not only wonderful stories for all to read, but to also grow together and move forward, expanding on our little corner of the final frontier. Starbase is a multi-award winning sim and community. We’re a two time recipient of the ‘Simming Prize’ (2012 and 2014) as an outstanding sim. We’re also a 2017 recipient of OnGoing Worlds’ ‘Squiddie Award’ for ‘Facilitating the Community Experience’ as an outstanding sim. We were Bravo Fleet’s first Sim of the Year in 1997, and since that time we’ve also been awarded Sim of the Month on eight separate occasions, as well as Sim of the Quarter and Bravo Fleet’s Admiralty Unit Citation in 2017. We’ve also received over forty awards for our website’s content and design over the years. Starbase 400 is also managed by the 2011 Simming Prize winner, Mike Bremer. 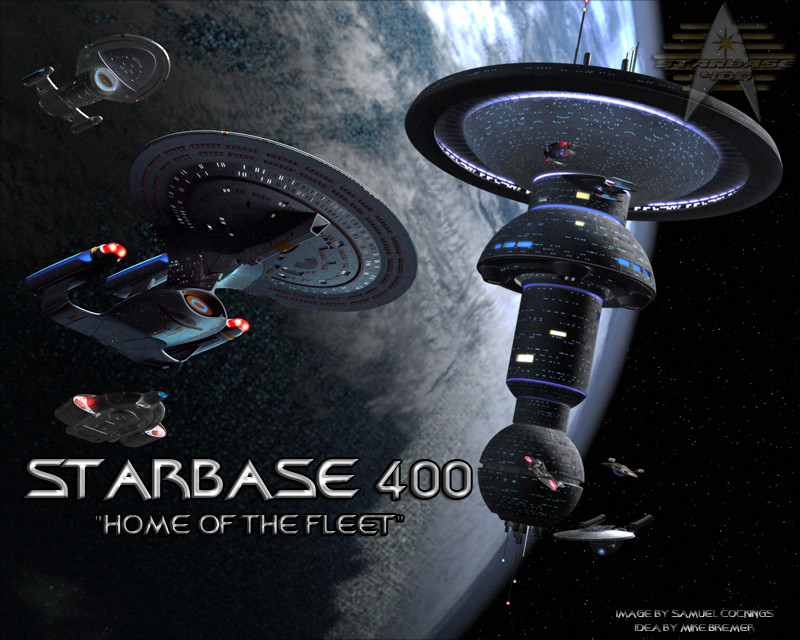 Starbase 400 is a Nova played sim that’s been active continuously since 1995. For over 20 years we’ve provided quality interactive simming for new and veteran players alike. We take Canon Trek and mix it with elements of Simi-Canon as well as the Sim’s history to make a unique simming experience for everyone! Our LCARS site features a custom menu with data ranging from a Historical Timeline to Support Ship specs, a full Star Trek database to image galleries. Read though our mission logs, galactic news, apply for our web design award, join our Banner Exchange, or tour the Starbase. The NOVA site also has crew info, mission logs, an application to join SB400, and much more! Take a look around, we know you’ll be impressed. Join the Adventure! starships: 30 Permanently assigned ships (USS Pegasus-B, USS Essex-B, USS Gladiator, USS Yorktown-F, USS Sutherland, USS Sentinel, USS Endeavor, USS Avenger, USS Conqueror, USS Saratoga, USS Ark Royal, USS Tirpitz, USS Luna-A, USS Steadfast, USS Lexington-D, USS Falcon, USS Mercy, USS Durga, USS Vanguard, USS Venator, USS Kearsarge, USS Constantinople, USS Princeton, USS Cutlass, USS Laffey, USS Warspite, USS Dorsetshire, USS Crockett, USS Ranger, USS Kashin), capable to holding up to 40 ships in it’s internal bays, depending on ship sizes. Commanding Officer of Starbase 400, Flagbase of the Ares Operational Theater in Beta Quadrant. Flagship is the USS Pegasus NCC-1702-B. Average height and weight, muscular. Looks like the normal Human, but has a Klingon Physiology with one exception, he does have tear ducts. Mike's heart is ALL Klingon, but he does have a soft side few get to see. He wears a silver Klingon Ha'quj, 'baldric' and belongs to the House of Martok, since 2374. K'Wor has short hair but easily can grow it long, when he does, he wears it in a pony tail. Mike sometimes also grows a gotee that is thinly trimmed and shaped. Tactically sound thinking, a cunning warrior. Mike isn't a fan of 'flying a desk', but over the years has grown to love Starbase 400 and the adventures that have come with it. Her Vulcan abilities includes mind-meld and the Vulcan Nerve Pinch. She has the strength of a Vulcan. She can sometimes connect telepathically with a non-telepath, put a suggestion in a person's mind (TOS:The Omega Glory) and she can sense strong emotions such as fear, hate, anger, sadness, etc. She has had some training in the Betazoid way while she was serving on the USS Zhukov as Assistant Counselor. Intelligent, tactically sound mind. Fearless warrior. Protective of his family and friends. Strong believer in the ideals that the Federation and Starfleet were founded upon, sometimes called a Patriot. Didn't want to be made a Flag Officer, wanted to remain as a Captain were he can be 'in the field'. K'Temoc has been able to remain 'in the field' by being based at Starbase 400 will his ship, the USS Yorktown based out of there. Aside from his duties as Task Force 99 Commanding Officer, K'Temoc also commands the Special Operations Team for Starbase 400. K'Temoc is currently dating Lieutenant Danielle Cole, a Science Officer aboard Starbase 400. Thomas Jonathan Jackson was born on September 11, 2356. His place of birth, and upbringing was in Athens, Alpha Centauri. His late father Jonathan Jackson, was a Senator in Alpha Centauri's Senate. His mother, Candace Jackson, is a school teacher. His Cousin is the Governor of Alpha Centauri, retired Admiral Phelan Ward. He is a Veteran of the Dominion Wars, including the Second Battle of AR558. He is currently assigned as Division Commander or the 1st Marine Division "Sheep Dogs". Lieutenant Commander Jack Solomon is currently the Chief Engineer on board Starbase 400. Jack has served there for the past four years since being re-assigned after spending time working for Starfleet Intelligence. Originally Jack entered service as an Ensign aboard the USS Wildcat-A under command of Captain Tomas Wolfe. When that ship was destroyed, he stayed on to serve under Admiral Wolfe on the USS Wildcat-B, rising to the rank of Commander and First Officer. When the USS Wildcat-B was decommissioned, Jack moved over a Chief of Operations on board the USS Essex. This is where he met his friend and current partner Admiral Deela T'Lar. After being re-assigned to Starfleet Intelligence, Jack suffered on several classif missions and is glad to be back in "Normal" Service for Starfleet. Hades is the CMO. He returned to work after a year long leave for an undisclosed illness. He was forced to return to work almost as soon as he woke up form the Coma he was in. He has since been assigned to Starbase 400 where he served as the Assistant CMO. When the CMO left he got promoted and has been the go to doctor since. He is well respected and has an excellent beside manner. This is Ariana’s first assignment since the death of her husband. She had promised him that she would carry on with her life and is currently pregnant with the child she & her husband Jonathon had wanted. Recent addition to the SB400 medical staff, serving as Assistant CMO. Alex was on the USS Pegasus as the Assistant Chief Security/Tactical Officer then transferred to Starbase 400 and promoted to Chief Security/Tactical Officer. She eventually changed her position to Special Operations Group Executive Officer. Noble, loyal, honest. He will put the people he cares about above his own needs. Tactically sound in Starship Operations, and a cunning Warrior on the ground. Avid weapons collector...mostly bladed. Human and Klingon mostly. Owns an 800 year old ivory handled Katana, a 600 year old Klingon Bat'leth, 1000 year old Scottish Claymore, and a 400 year old Klingon Mek'leth to name a few. Paul is also welcome trained is several martial arts such as Karate, Judo, mok'bara. A little calm for the typical Jem Hadar. Odo's former First, Commander of his personal Commando Team and Body Guard. Loyal, with a sense of honor not usually found among Jem Hadar. Physical strong. Great warrior. Willing to listen to new ideas, loyal to his crew mates, but can at times become violent/aggressive. can insult spar with the best of them. Entered Starfleet Academy in 2370 following his graduation from Stanford University. Lost his brother early in the Dominion War. A quiet man, with a sarcastic side. Doesn't apply himself as well as he should at times, but doesn't let his friends or crew down. Has a knack for engineering and building things, even attended Stanford because of this, but wasn't satisfied so he took tactical courses at Starfleet Academy. Very analytically and tactically sound thinking. Wanted to be a school teacher when he was younger, Rich later decided to join Starfleet. Stronger than he appears to be, determined, dedicated to his job and protecting the Federation. Rich has a whit about him, and can sarcastically spare with the best of them. Well trained in multiple forms of hand-to-hand combat and the use of personal weapons. Smart and skilled. He's not the biggest or the strongest guy, and he can be over-powered at times. He can get out of tough situations with excellent pre-planning and thinking on the fly. Enjoys running, soccer, reading, model building. Likes various types of music. High sense of duty, loyal to his friends and family. Strong willing and always gets the job done. Has a strong sense of justice. Analytical thinker. Physically fit, strong. He's Dutiful, loyal. Strong willed but he's also still young and learning. Sometimes has a 'youthful idealist' attitude, but he shouldn't be seen as 'innocent' or naive. Carter is an avid runner and kickboxer. Skilled fighter. Loyal to his friends, but his loyalty is hard earn. Family is extremely important to him. Believes strongly in Starfleet's mission. Has a clear view of right and wrong, there's no much gray area in his opinion. Wants to own a ranch in Texas...at some point after getting a Starship command of his own. Enjoys kickboxing, jogging, horseback riding, and old Earth 'western' movies. He's also a history buff. Klaus Gunther was born on November 24, 2368, in a small town called Leonides on Alpha Centauri. He is the son of an accountant, and a civilian nurse. He completed his Secondary education at Leonides High School in 2386 as Valedictorian. He entered Starfleet Academy that same year. He is currently a Squadron Commander in the 181st Tactical Fighter Wing. He is a Combat Veteran. His call sign is "Frogger". Gaius Marcus Aquila was born March 1, 2356. He is a member of a high level aristocratic family on Magna Rome (892-IV). He is the youngest of two sons. He is widowed with two sons. He is rooted deeply in the sense of Magna Roman honor. He prays primarily to the god Mars. He comes from a long time family martial tradition, and is the second generation of his family to serve in their still young membership in the Federation. At the age of 16, with the blessing of his family, he enlisted into the Star Fleet Marine Corps. He is currently assigned to the 1st MARSOC Group as its CO. He is in a relationship with Holly Gillo, the Chief Operations Officer of the star base. He is a Dominion War Veteran who served in the Second Battle Of AR558. Atlee Micklin was born at Columbia, South Carolina, Earth on August 23, 2343. He is the son of a starship construction worker, and a teacher. In the "utopia" type economy on Earth, he came from a poor family. Upon completion of his Secondary Education, he joined the Federation Marines, seizing the opportunity to leave his impoverished life behind, and follow in his brother's footsteps. He is currently a Team Leader in the 1st MARSOC Group. He is a Second Klingon War Combat Veteran, Dominion War Veteran. Gibbs was born in 2350 on the Cestus III Federation Outpost. His father is a retired Command Sergeant Major in the Federation Marines, and was assigned to the outpost garrison when he met his wife. In 2368, Giibbs enlisted into the Federation Marines. He is currently the MSAU NCO of Starbase 400. He is a Dominion War Veteran. David Ugo Henry was born April 1, 2363 at Lake Armstrong City, Mars Colony. Being unable to focus, He barely made it through Secondary School. Being the son of a Federation Medal Of Honor winner automatically qualified him to be admitted to Star Fleet Academy. His father was more than happy to vouch for him, otherwise, he would still be living with his parents. He is currently assigned as a Platoon Commander in 2/22 Marines, 1st Marine Division. He is a Combat Veteran. He was born in Fort Worth, Texas, Earth in 2363. He currently serves as a Platoon Sergeant in A 2/22 Marines. He is a Combat Veteran against the Borg, and Klingon Rebels. Average height and weight. Short hair, clean shaven. Speaks with a slight Italian accent. Former Starfleet Officer, his records are sealed by order of Starfleet Command, but it is believed he was either a member of Starfleet Intel or the now disbanded 'Shadow Operations' unit. Tom currents owns and operates the ‘Good Fella’s Bar and Grille’ on the Starbase 400 promenade. Splendora owns Mind, Body, and Soul Health Centre, she is a Psychiatrist that practices on the side as well as has Starfleet bridge abilities to help treat Starfleet officers. Crumm Widdy is a young and virile Bolian of average height and weight. He will likely be found wearing the best and most current of Bolian fashion. As he is allergic to Retinax V, he is required to wear corrective lenses. Of the varying shades of blue Bolians exhibit, Crumm's is of the brighter and more vibrant variety. While this does not mean much amongst Bolians, some outsiders view this as a sign of stature within the Bolian community. A jovial man, Crumm is almost always smiling and is a joy to be around. Starfleet Command sends three ships from Starbase 400 to make contact with the Talaxian Colony where Neelix was left by USS Voyager in the Delta Quadrant and take them needed supplies / Two Talaxian Military Officer returns to SB400 as an Exchange Officer while five Starfleet Engineers remain as Exchange Officers / Joint Starfleet/Klingon/Cardassian/Free Romulan/C’hakilian fleet exercise conducted out of Starbase 400, Typhon Pact protests, calls them threatening. Starfleet Command orders Starbase 400 to restart the clearing of the Rashanar Battle Site, the site of a major battle during the Dominion War where both sides fought to a mutual destruction. Clearing of the bonyard started in 2376 but was halted in 2381 during the Borg crisis. Meanwhile, the Luna's covert mission to Nimbus III continues. Klingon civil war erupts in the wake of the failed attempts on Martok's life in Episodes 88 and 92. Fighting spills over into Federation space. Marines are to be stationed on Arcanus IV. Fighting also spills over into Federation in other areas resulting in the loss of the USS Falcon. Opposition Forces launch attacks on several key Loyal Klingon bases and manage to take over one while inflicting heavy losses. The Federation can only watch.